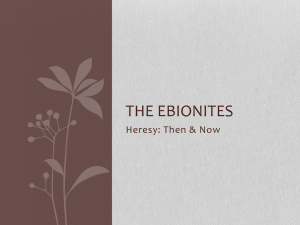 Ebionites, or Ebionaioi (Greek: Ἐβιωναῖοι; derived from Hebrew אביונים ebyonim, ebionim, meaning ""the poor"" or ""poor ones""), is a patristic term referring to a Jewish Christian movement that existed during the early centuries of the Christian Era. They regarded Jesus of Nazareth as the Messiah while rejecting his divinity and insisted on the necessity of following Jewish law and rites. 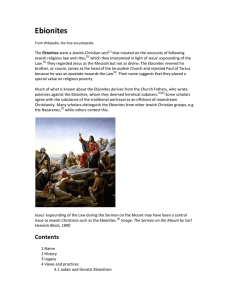 The Ebionites used only one of the Jewish Gospels, revered James the Just, and rejected Paul the Apostle as an apostate from the Law. Their name suggests that they placed a special value on voluntary poverty. Ebionim was one of the terms used by the sect at Qumran that sought to separate themselves from the corruption of the Temple, whom many believe were Essenes.Since historical records by the Ebionites are scarce, fragmentary and disputed, much of what is known or conjectured about the Ebionites derives from the Church Fathers, who wrote polemics against the Ebionites, whom they deemed heretical Judaizers. 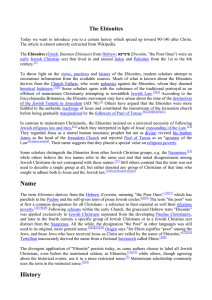 Consequently, very little about the Ebionite sect or sects is known with certainty, and most, if not all, statements about them are conjectural.At least one scholar distinguishes the Ebionites from other Jewish Christian groups, e.g., the Nazarenes; other scholars—and the Church Fathers from the first centuries after Christ, themselves—consider the Ebionites identical with the Nazarenes.